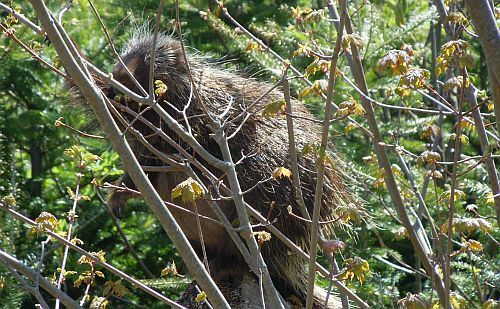 Over the past year, chewed tree branches too high for deer to reach indicated a porcupine was likely dining regularly in the backyard. 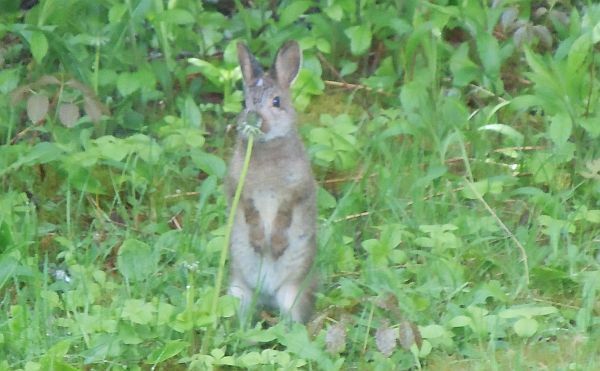 This week I finally spotted the suspect in action, munching on maple. 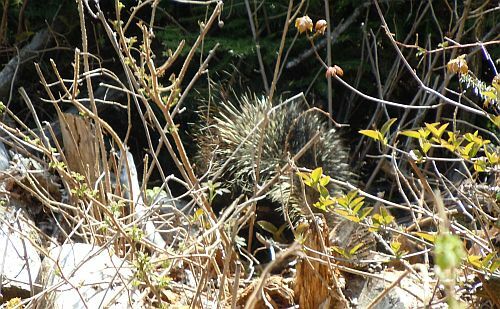 Since porcupines are usually active at night, I was surprised to see him late on a bright, sunny morning. His black claws and the long hairs of his fur shone in the sunlight. As soon as he heard me, he froze. His underbelly appeared soft and vulnerable. 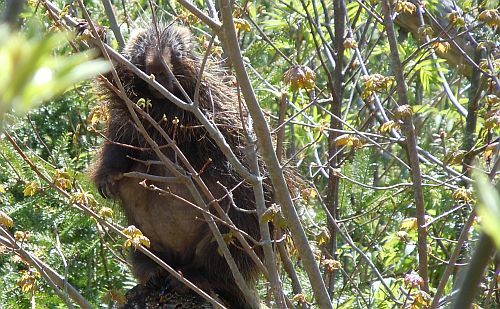 Porcupines are protected by law in some North American locations as they are easy, nutritious prey for humans lost in the woods who may be armed with nothing more than a stick. When I decided to move closer, his brunch interrupted, he slowly came down from his perch on the tree stump next to the branches, and made his way into the bush. His quill-covered back was huge but seemed so well camouflaged in its woodland setting. You wouldn’t want to step on that by mistake. 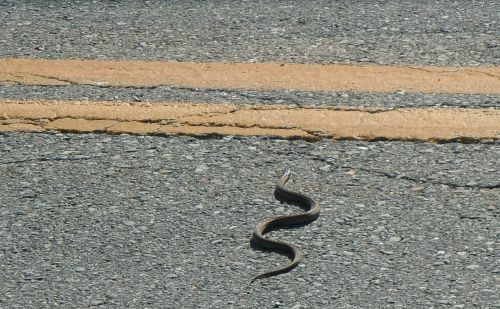 Another reason to walk, not run, in the woods. 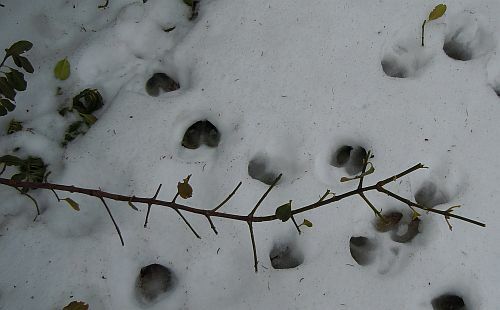 Who’s been nibbling all the leaves off the partridge berry bush? 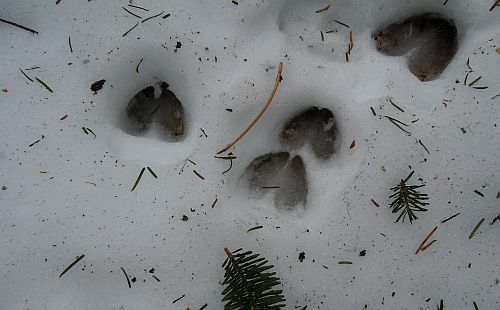 Have the snowshoe hares been at it again? 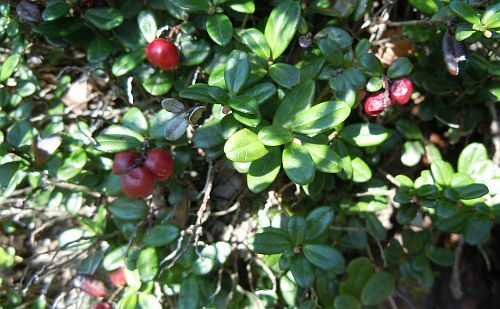 I’m sure its evergreen leaves are tempting, especially in early spring, after yet another snowfall has covered the ground. And who ate all those leaves off the euonymus branches right next to the house? Despite a long, harsh winter, this plant was still lush green and thriving until… this morning. Early this morning around 1:30 am, I was able to see half a dozen white-tailed deer moving slowly around the open area in the front yard. They looked so calm. Two were much smaller than the rest. 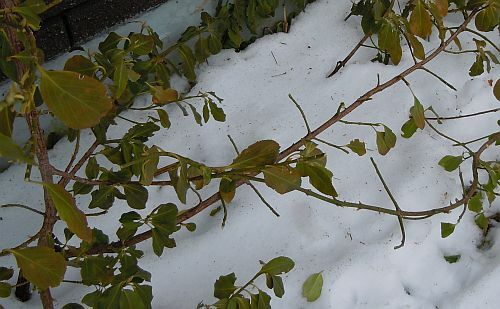 Three approached the house and began ‘pruning’ what’s left of the evergreen leaves on the euonymus. They were just a foot away from my vantage point on the other side of the living-room window. Guessing they’d soon be moving to the backyard, I slowly opened the back door. The last one to leave flashed his white tail as he entered the path into the deeper woods. Suddenly he stopped and turned back. As I stood there at the half-open back door, I watched him walk around the deck for a few minutes and then just quietly go into the deeper woods by an alternate path. It seemed like a dream. I’ve waited all these years to finally see one deer in my yard, and then I see half a dozen all at once! ‘Eat your greens’ we’re told from a young age. 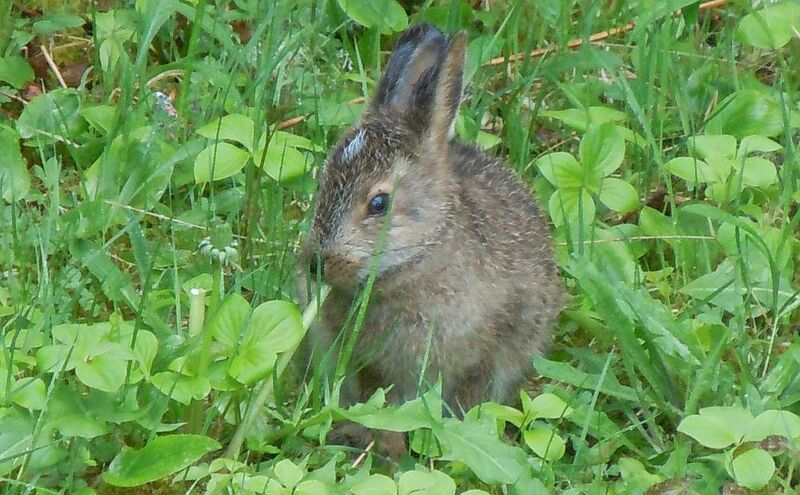 Young snowshoe hares need not be reminded. Nothing green seems to get overlooked by their taste buds. Once new growth emerges on the lower branches of fir and spruce trees in the yard, the tender needles replace dandelions on the hares’ seasonal menu. 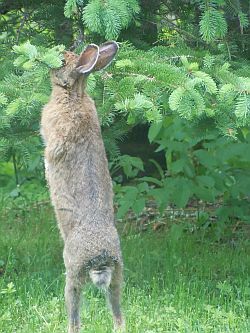 Hungry bunnies reach the higher branches by standing on their hind legs, carefully balancing themselves in order to grab a bite. 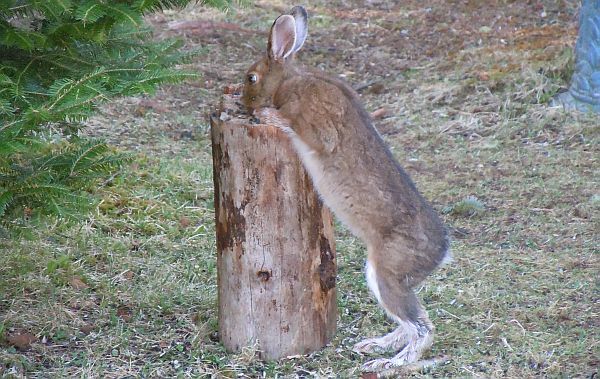 Who knew snowshoe hares could eat standing up?! 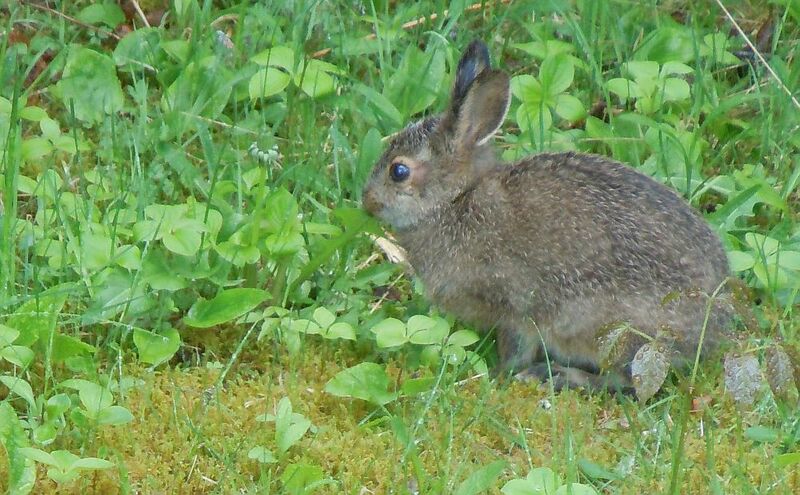 Snowshoe hares are amazing runners whose reproduction rates are legend. Could the greens in their diet be a key to their boundless energy? 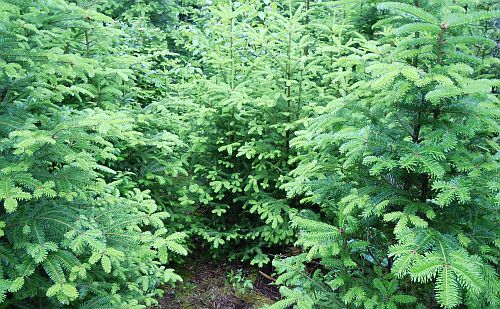 Even keen salad eaters wince at the idea of eating evergreen needles but we don’t need to eat an entire bough to benefit from such nutritious fare. 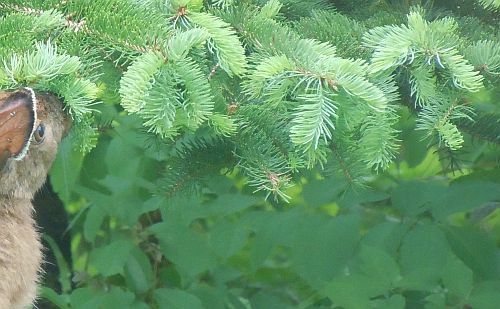 A simple tea made by steeping a sprig of new growth needles in hot water will provide a good dose of vitamin C. Balsam fir needles are used for colds, coughs and asthma according to my Peterson Field Guide of Eastern/Central Medicinal Plants and Herbs. As wild as it sounds, it’s probably tamer on the body than most drug store decongestants. 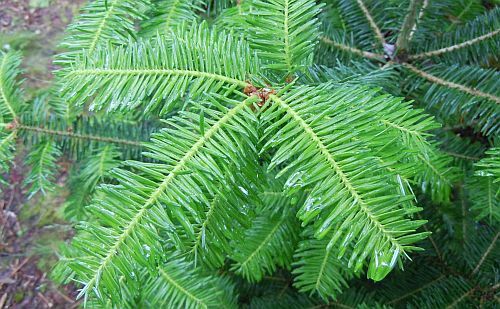 Spruce and fir needles can also be dried and crumbled for use as a wild accent in a variety of kitchen fare. Think of adding a bit to rice, venison or even Christmas cookies. At least the shopping aisle won’t be crowded and the Grocer’s selection will be a feast for the eyes as well. 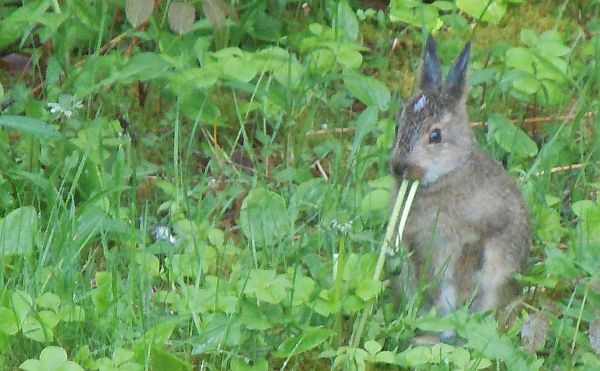 Recent rains have encouraged so much evergreen growth that Nature’s bounty will be great enough for both humans and hares to have plenty to share and enjoy. By any other name would be as healthy. 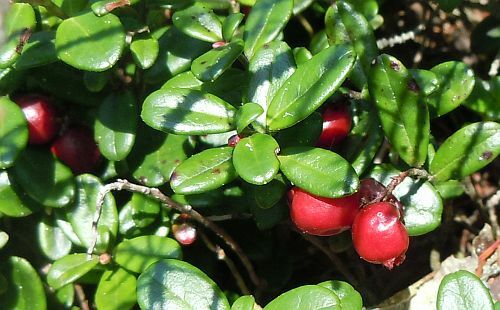 Cowberries grow in Cow Bay. Of course they do, you say. 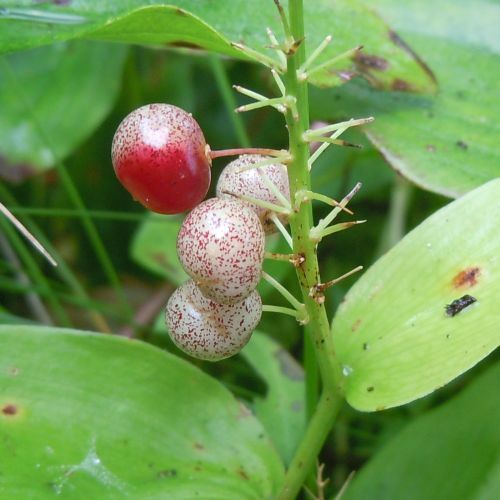 Where else would cowberries grow? Well, in a lot of places actually. They’re found in most countries located in the circumpolar expanse that encompasses the arctic tundra and the sub-arctic regions of the boreal forest (known as the taiga in Russia). 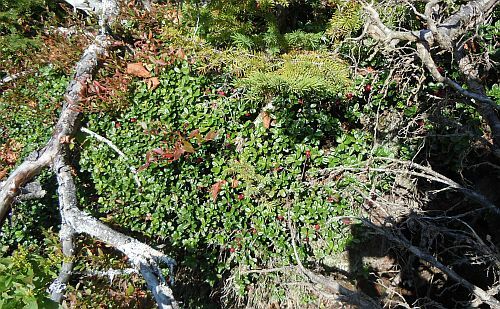 Vaccinium vitis-idaea goes by a number of names: partridgeberry, foxberry, redberry, lingonberry, quail berry, csejka berry, mountain bilberry, mountain cranberry, lowbush cranberry and… cowberry. Regardless of what it is called, this tart red berry is brimming full of anti-oxidants. 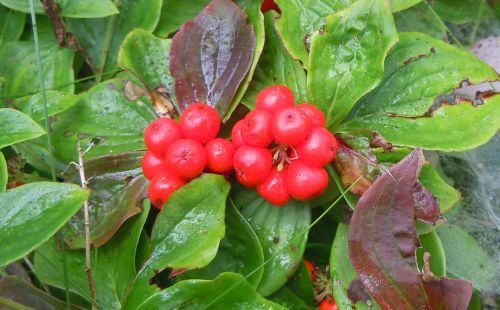 Native peoples and Scandinavians have known this for some time, but North Americans are just catching up on the news, making the lingonberry the new superstar natural food recommended for lowering bad cholesterol and fighting cancer. Dr. Oz puts lingonberries in a smoothie with almond milk while Scandinavians (even IKEA) and Newfoundlanders make them into a jam/preserve which can be spread on toast or served with venison, ideally reindeer meat. However, I enjoy the berries fresh off the vine, their flavor being a blend of blueberry and cranberry. Frost enhances their flavor but makes them more mushy. I also find them tasty crushed fresh and sprinkled with sugar as a topping for vanilla ice-cream. 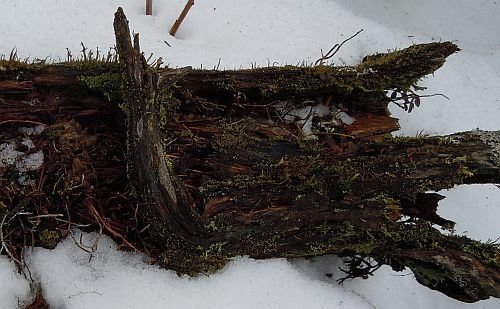 This evergreen vine often grows in boggy places. 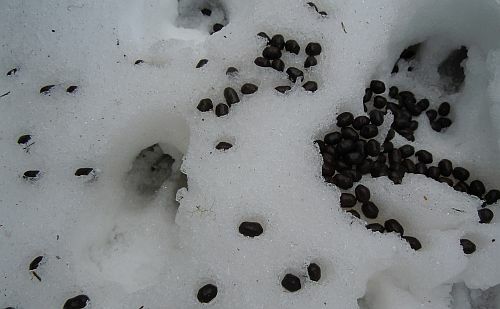 The ones I found were on or near deadfall trees in locations many would consider scrub wastelands. 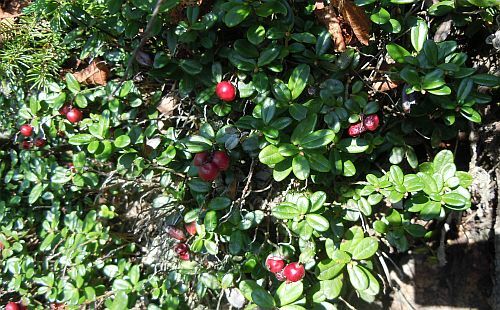 As old growth forests on the edge of wetlands are destroyed to make way for new ‘developments,’ I’m sure these wonderful berries will become less common here in Cow Bay Nova Scotia, and consequently even more prized for their healthful properties.